BY OFFERING luxury service (even in coach) and low operating costs, three Middle Eastern airlines — Emirates, Etihad Airways, and Qatar Airways — have become the fastest-growing global aviation market. Their location gives them an advantage, as roughly 4 billion people live within an eight-hour flight radius of the Middle Eastern cities where the airlines are based, making Dubai, Abu Dhabi, and Doha logical stopovers. Since 2000, the number of flights and destinations the companies offer has multiplied exponentially. (Etihad Airways did not even exist 11 years ago.) The growth of the airlines’ respective networks, from China and India to Africa, South America, and the United States, also mirrors the tighter economic ties between regions. Chinese exports to the Arab world have soared over the last decade, from $6 billion to $60 billion. 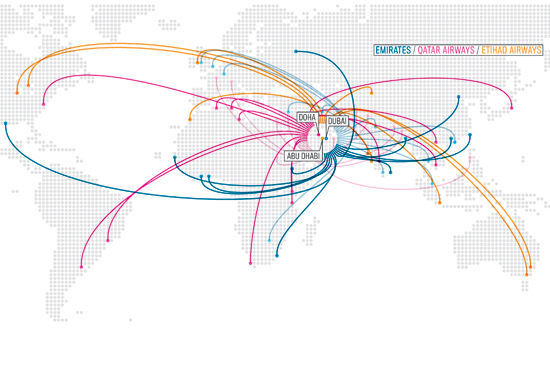 Here, Fast Company shows the expanding reach of the three Gulf carriers from 2000 to 2010.